Welcome to the Africa Digital Media Academy, a vocational training program in Kigali, Rwanda, that is the first of its kind in Africa. 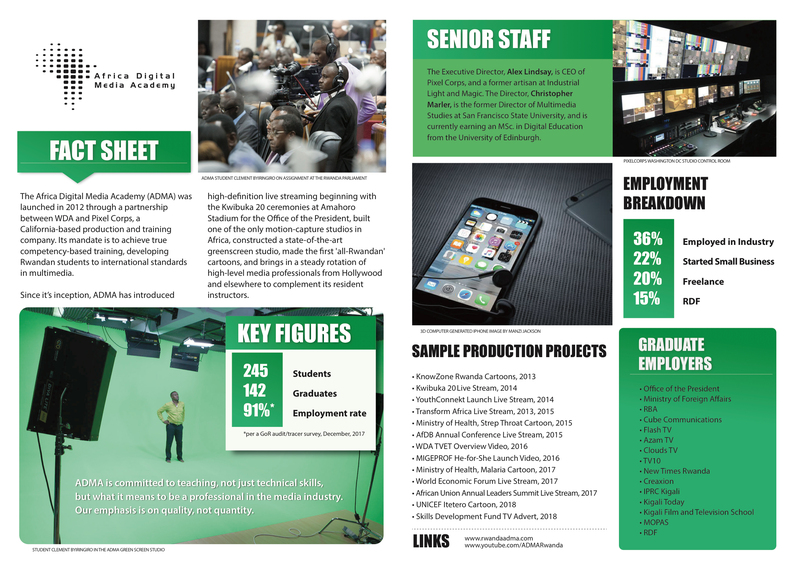 We provide students with the skills necessary to work in all areas of the digital media industry with the same degree of talent and resources as anywhere else in the world. The ADMA is a partnership between the Workforce Development Authority in Rwanda and Pixel Corps, a company based in California with over 10 years experience preparing people to work across different aspects of digital media. Our goal from the outset has been to provide students with the same training and facilities as anywhere else in the world. Our team consists of administrators, resident and visiting instructors from all over the world. Visiting instructors either directly interact with the students on site or via Google hangouts. Resident instructors makes it easier to deploy basic training. From time to time we engage the services of visiting instructors who are well-respected specialists in specific areas. We offer a three-tiered training programme with students initially undergoing a set of introductory classes to familiarise themselves with different applications and digital media processes. The second phase brings students up to industry standards practices while the third phase consists of master classes to allow students to specialise.